A hands-on place to hold a team building scavenger hunt in the Minneapolis-Saint Paul area. 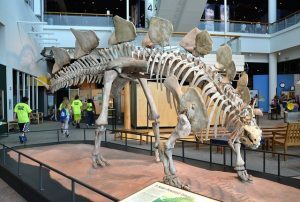 Event Description: A fun place for a corporate team building event, the Science Museum of Minnesota has something for kids and adults of all ages.Saint Paul’s dazzling science museum has been delighting visitors since 1907. With a 10,000-square-foot temporary exhibit gallery, five permanent galleries, 10 acres of outdoor exhibits, and an Imax Convertible Dome Omnitheater, the Science Museum of Minnesota is a little bit laboratory, a little bit Las Vegas. Perhaps best of all, it’s cool in the hot, muggy summers and warm in the cold, frigid Minnesota winters. This is a great place to learn about the world in all its diversity—without getting your hair mussed while you’re running around, solving clues! During your corporate team building treasure hunt… expect to visit a full-size towboat, a giant bear, a musical staircase, dinosaur bones, a giant periodic table and much, much more. Admission not included in program fee.